Sometimes there’s nothing like playing video games with your friends. For some that usually means something along the lines of Halo, Gang Beasts, or Goldeneye though a nice co-op game works now and then as well. A lot of those though are games such as Halo (again) and Borderlands where you’re running around doing various missions and taking out anything that crosses your path. Sometimes though you just need a nice, relaxing co-op game where you can take your time and work together to solve puzzles. Nothing is trying to kill you or rush you through the game. 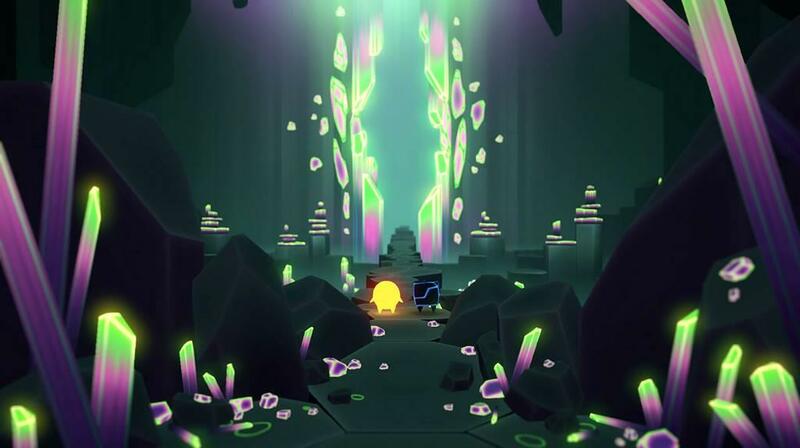 This is where Pode enters the fray. 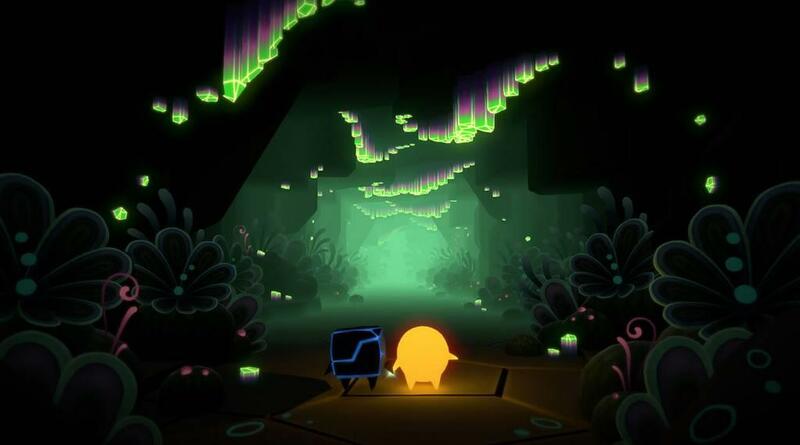 In Pode, you control two characters named Glo and Bulder as they attempt to make their way through a series of caverns in Mount Fjellhei in an attempt to get Glo home. 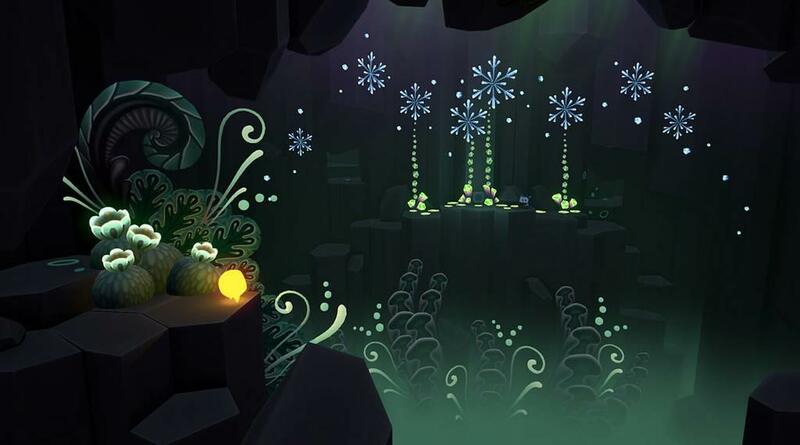 Glo, a lost star, can use his light to light up darker areas of rooms, reveal drawings on the walls, and cause various plant life to blossom to create and manipulate various platforms. Bulder, a little…well…boulder, can activate switches and inhale blocks to transport them around. The caverns they find themselves in contain a series of puzzles that the two must work together to solve. 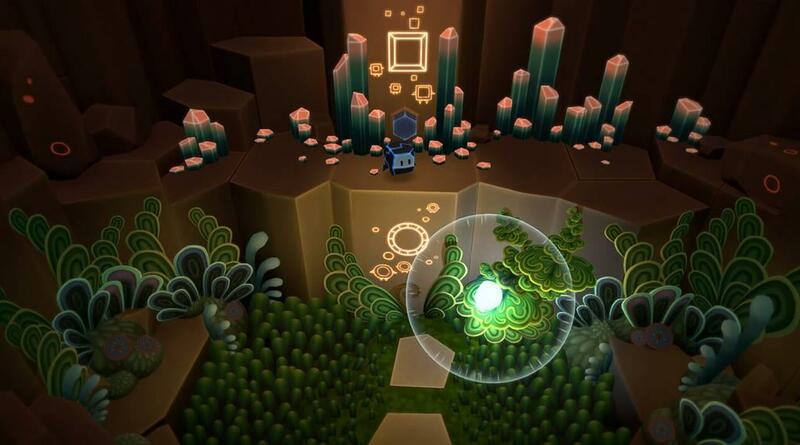 Pode can be played alone or co-op with a friend and I’ll get to my thoughts on that towards the end, but as you’ll see from playing through the game, Pode is a game built around helping one another solve the puzzles you come across. As stated, Glo and Bulder each have their own abilities and while they start off kind of minimal, you’ll gain some more as you progress. As with everything else, the abilities each character gains can be used in conjunction with the other character to help solve the various puzzles you’ll come across. For instance, I stated that Bulder can inhale blocks to carry around. As it turns out, Bulder can also inhale Glo, then by switching to Glo you can activate its glow aura to help light things up a bit more. 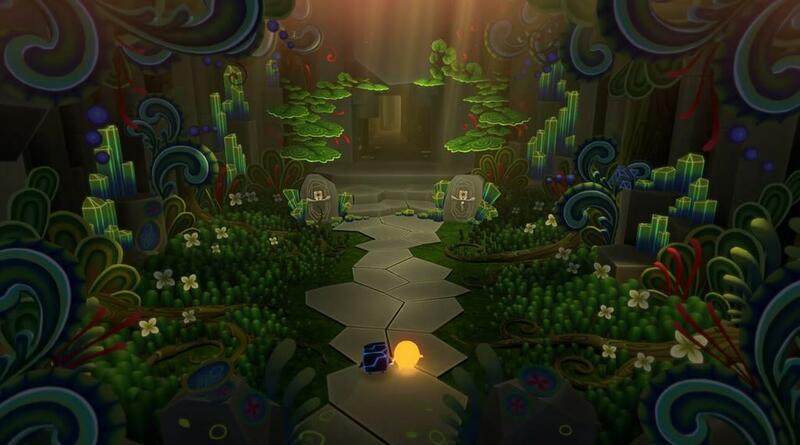 Part way through the game Glo will learn the ability to leave its light in a specific spot, then teleport back to that point with the press of a button. By allowing Bulder to inhale Glo you can teleport both of them to the same location to proceed. As you progress the puzzles get more complex and new obstacles are introduced and you learn more about what Glo and Bulder can do. About a third of the way through you are introduced to areas with water. Glo is light enough to walk on water, but seeing as Bulder is a rock he just sinks to the bottom. This is around the time that you learn how to teleport with Glo so you have to figure out how to use both Glo’s and Bulder’s abilities in conjunction with each other to progress. 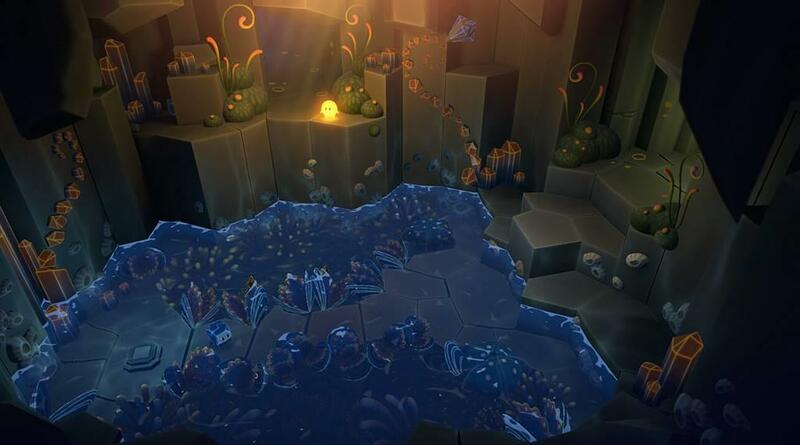 Glo can’t pass through waterfalls, so you might have to have Bulder press a switch underwater to shut off a waterfall for Glo to pass through and activate another switch that will allow Bulder to progress further into the puzzle, and then ultimately use Glo’s teleport ability to warp to wherever Bulder ends up. It’s interesting to see how their abilities can be used to progress through the various caves. 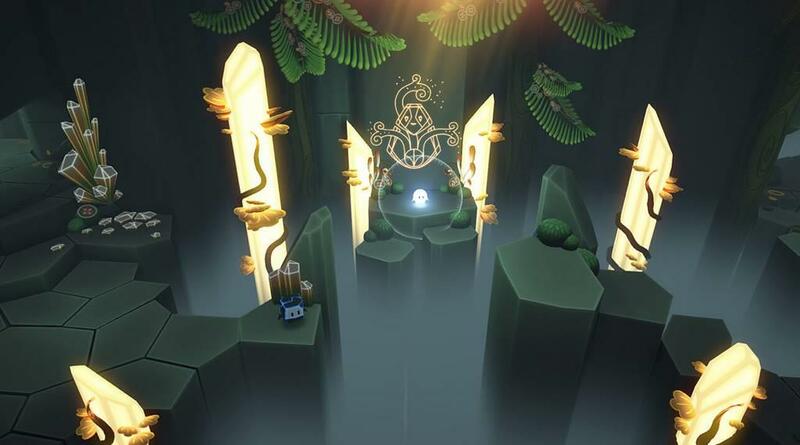 I don’t tend to talk a lot about a game’s atmosphere in my reviews, but I’d be remiss if I didn’t mention how relaxing the atmosphere is in Pode. There were quite a few times in the later areas where I was starting to figuratively bang my head against a wall in trying to figure out a solution to a puzzle. The music is so relaxing though that I would just sit back and think about the puzzle for a bit while listening to it and…well, to be honest I’d just keep listening to the music for a while. It’s a nice feeling to not have to frantically scramble around for one reason or another and to just sit back and enjoy the game at a leisurely pace. That said, some of the solutions to the puzzles can be pretty hard to figure out in the later areas. You might have to check every nook and cranny to see if you missed anything. There were times where I easily missed a block or switch that was hard to see due to the angle of the camera, and unfortunately you can’t switch POVs to my knowledge. Now granted this was while playing with the Switch off of the dock and without co-op being turned on, so playing on a bigger screen might help in some instances. I will say though that using Glo’s light aura pretty much constantly to light up the room helped a lot, but if you’re ever stuck on a puzzle, be sure to check everywhere…and I do mean EVERYWHERE. One puzzle early on required me to raise and lower a few stone formations to various heights and I thought I missed something in an early room or rooms that told me the combination to proceed. Turns out the solution is in that room, but it can be very easy to miss. So a few minor nitpicks aside, are there really any downsides to this game? Well, one, and it’s something I said I’d get back to: the co-op. Not the co-op itself, but the fact that this game seems to be geared towards co-op. To put this into perspective, I’m not saying that single player is bad. it’s just that this kind of game lends itself to co-op more. In single player you have to keep swapping back and forth between the two characters and use their abilities as needed to progress. You can hold L to move them simultaneously if you need them near each other. With co-op, each player takes control of a character and moves them around at the same time. They can still swap characters if someone is trying to perform a certain task with a particular character and is having trouble doing so. Plus having two people work on a puzzle together helps to find a solution faster. 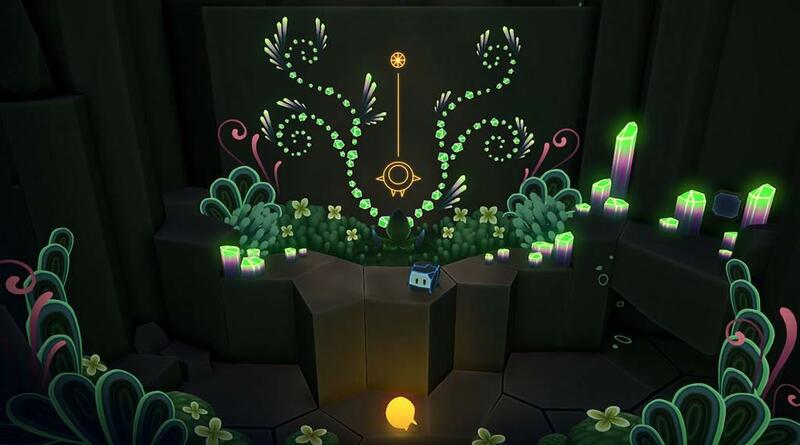 If you’re looking for a nice relaxing puzzle game, Pode is a good one to check out, even more so with a friend. Even single-player is a nice experience if you don’t mind having to constantly swap between Glo and Bulder. It has a nice relaxing atmosphere and art style that you can enjoy while progressing at your own pace. If you have twenty-five dollars to spare, grab a friend and travel through the caverns of Mount Fjellheim to help a lost star find his way home. 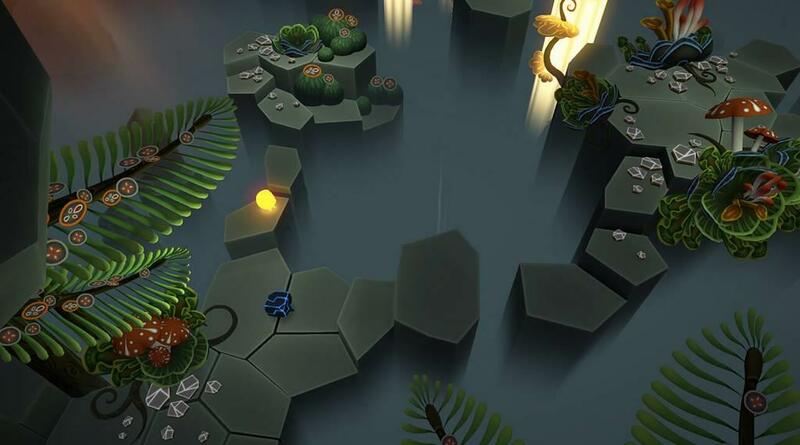 Pode is a fun and relaxing puzzle game that starts out simple and becomes more complex as the game progresses and you gain new abilities. While the game is meant for co-op play, it plays just as well single-player, though you will have to constantly swap between Glo and Bulder. 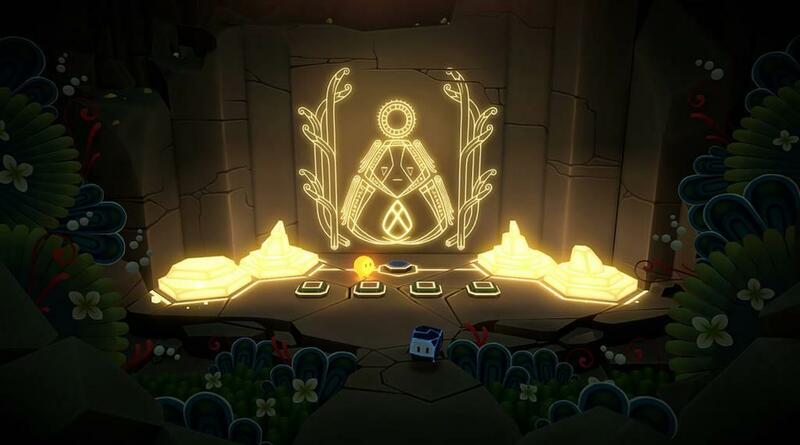 Having a second player can also help with solving puzzles as you have a second person helping you out, but alone or with a friend, with its enjoyable art style and relaxing atmosphere, Pode is a puzzle game worth checking out.